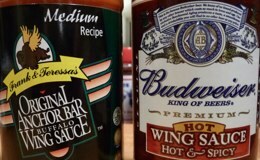 While there are dozens and dozens of choices of “ready to use” Wing Sauces available from your local grocery store, we picked two, almost at random, for this review – Anchor Bar’s Original Wing Sauce Medium, and Budweiser’s Hot Wing Sauce. First up is the venerable Anchor Bar’s Wing Sauce Medium. 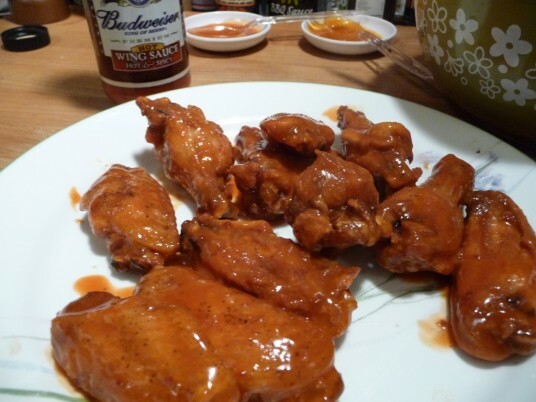 Most everyone knows that the Anchor Bar in Buffalo, NY, is the birthplace of the “buffalo wing”. 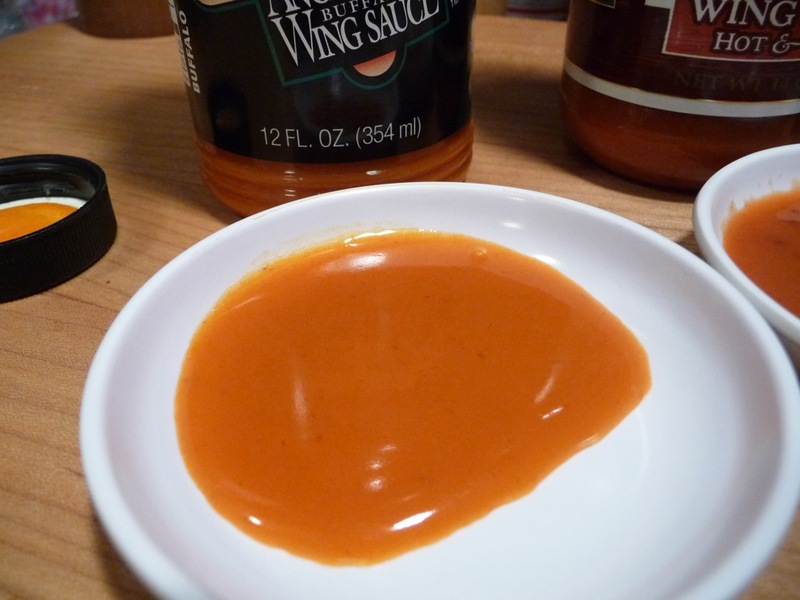 Texture & Appearance: Very orange in color, with powdery bits of seasonings – a smooth sauce in texture. Taste: On wings – nice traditional, thin coating with a strong cayenne based flavor. No artificial butter taste. 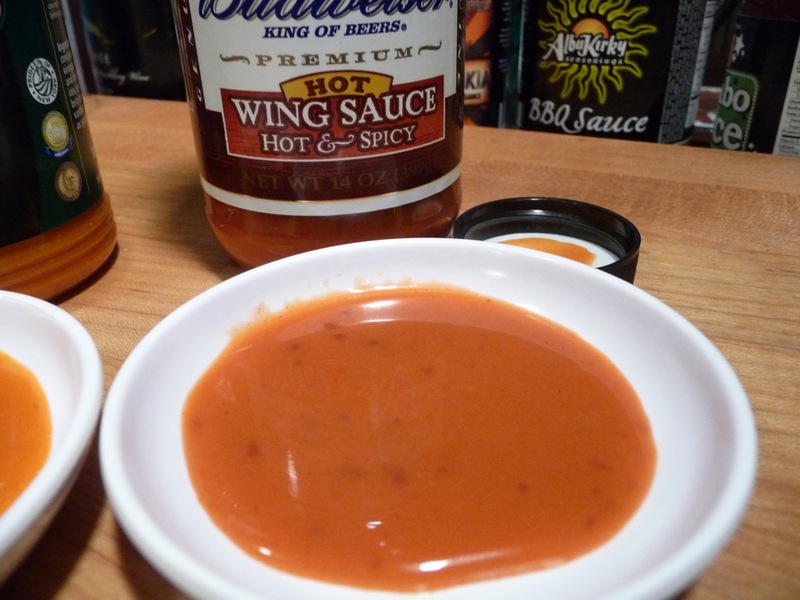 The story is they used Frank’s Red Hot and butter when they created Buffalo Wings, but this sauce is milder, friendlier, more well rounded. Not as much vinegar as Frank’s. Not too hot, with a classic mild buttery taste. Delicious. Heat Level: – mild overall with a nice singe of heat on the lips and front of the mouth. Overall Rating: – Serve these to your average group of friends and everyone would be happy. Wings for the masses. We really enjoyed these wings. …developed by Budweiser’s executive chefs from Kingsmill Resort in Williamsburg, VA, in conjunction with the brew masters of Anheuser-Busch. Taste the difference of these premium sauces that only the finest ingredients can deliver. Texture & Appearance: Red bits, probably from the dehydrated habanero – with a darker red color. On the thin side, much like the Anchor Bar sauce. Taste: On wings – big pungent vinegar flavor at first, very dark flavor probably from the beer, less buttery than the Anchor Bar sauce, flavor is a little “flat”. Not as deep and complex flavor as the Anchor Bar. Little character. Too much vinegar and heat, and little flavor. Heat Level: – quick heat burns the back of the mouth and throat. A typical habanero heat with too much vinegar. 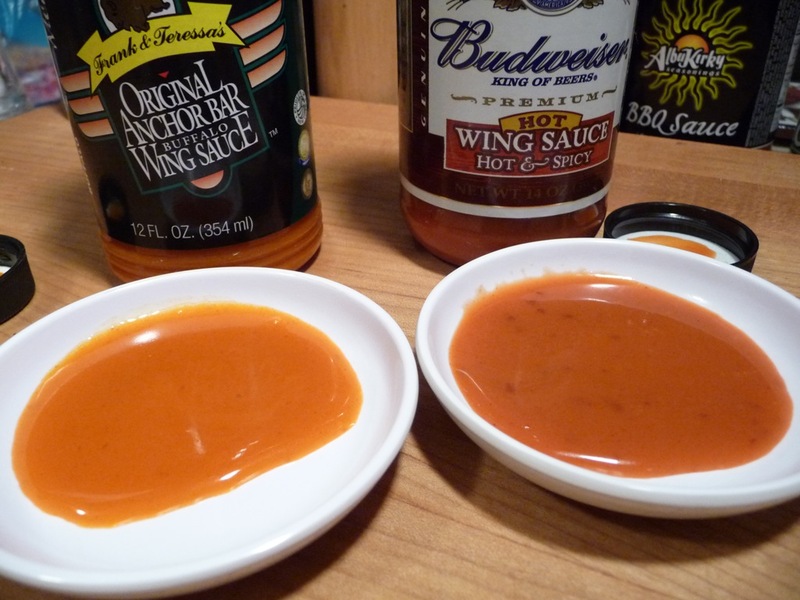 Neither sauce tasted particularly good straight up out of the bottle… these aren’t “hot sauces” after all, but each got so much better after tossing with hot fried wings. The Budweiser sauce tasted much more “processed” and one-dimensional, and carried more burning hot heat with very little flavor, whereas the Anchor Bar sauce had character and depth of flavor. We lightly salted and peppered the wing sections, then baked them at 350º for 25 minutes on a parchment paper lined baking sheet. We let them rest before dropping them into 360º oil for 3 to 4 minutes of frying, until they were brown and crispy. We then tossed them immediately into the sauces. 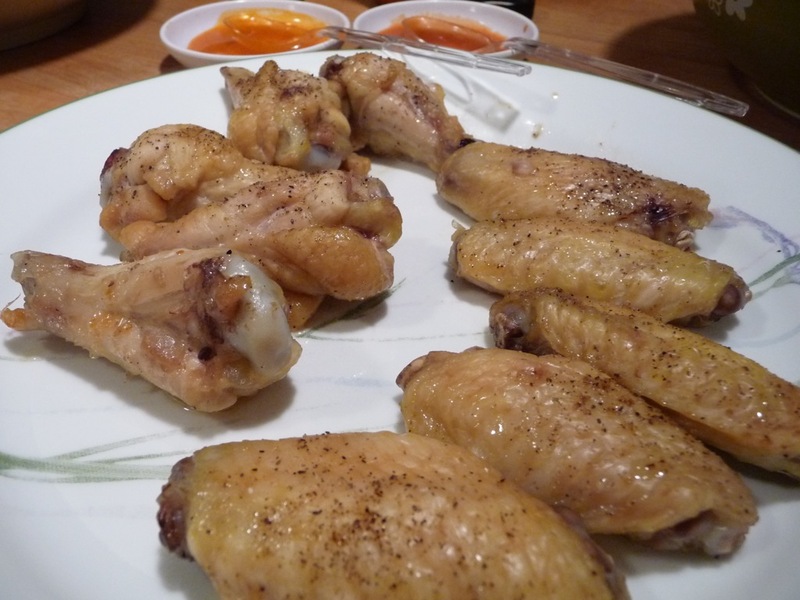 This has been our go-to method of cooking wings (for deep frying), when grilling is not an option. 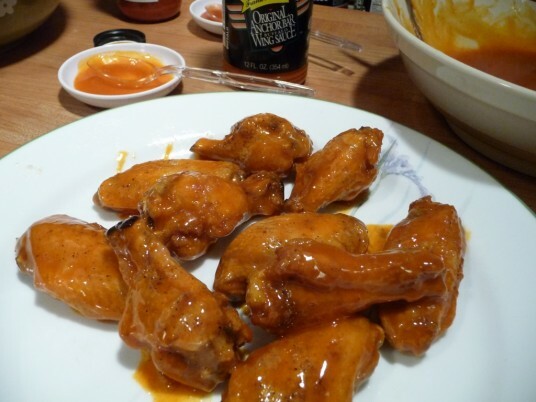 See our post about Wings 101 – How to Make Great Hot Wings at Home.